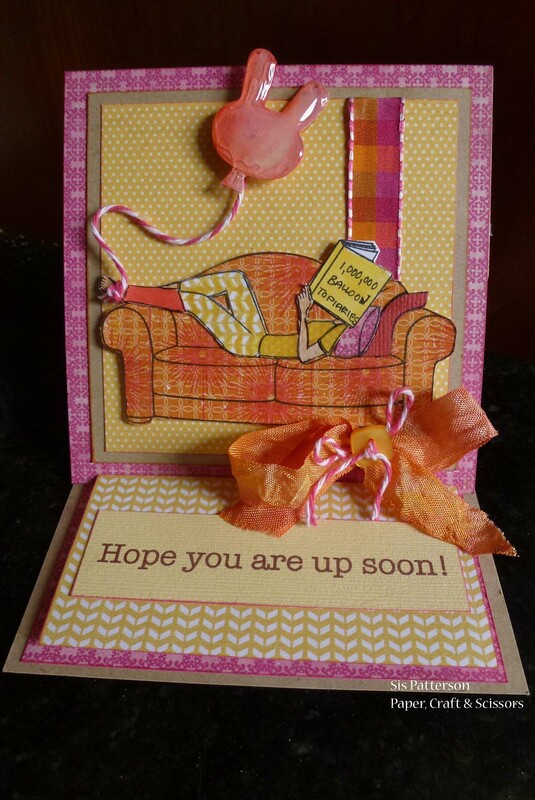 This card is for a friend who has been laid up with a broken ankle. She creates amazing balloon decorations so I hope she will get a good laugh out of this card during her recovery. And while I missed the deadline for submitting this card to a pink, yellow, and orange color challenge, I am still tickled with this cheery card – orange being one of my favorite colors. There is only a little Cricut (the “balloon” bunny head is from the Spring Holiday Seasonal cartridge). I removed the eye and nose cuts on the bunny head using the Cricut Craft Room. It has a lot of Diamond Glaze and Glossy Accents to give it more balloon-like dimension. The little triangle at the bottom of the balloon was hand cut. To make the balloon look more like it is floating, the baker’s twine is tied to her foot and attached behind the balloon with a pop dot. The remainder of the twine floats above the paper. The couch and reclining reader are from a My Favorite Things stamp. In my first attempt at paper piecing, I paper pieced the sofa and reader. I hand cut her pink cast and outlined it with a Copic multiliner so it would look more like it was part of the original stamp. The sentiment was printed. If you’d like to make an easel card yourself, here is a great tutorial. This is a great card! I love the balloon attached to the cast! I am so out of the loop but am I reading that Gina has broken her ankle? I need to check in on the Cricut Circle message board! This is fantastic! I love how personal you make your cards for the recipient. I know she will love it too. Maybe you’ve given her an idea to write that book! Oh my gosh! She is going to LOVE it. It’s fabulous! This is brillant! My SIL just broker her leg and had sugery last night… I may have to steal this idea and link it back to you! I will try see if I can work with some Cricut Carts I have to make the person.. BTW: Thanks for the lovely words of encouragment on my blog today! That is a fabulous card!! I would have never known it was paper pieced if you hadn’t said so lol. Hope your friend is mended soon. Love that balloon! This is so fun and cheery and personalized to it’s recipient. I love how you work so hard to tailor each card to the lucky person receiving it. Very fun and fabulous. Love the balloon tied to the cast. So cute! How sweet is this card!!!?? Love how personal and cheery it is!